It’s this time already and I am about to start chopping the new design. I have taken a local copy of all the server files and have setup everything so as soon as I press save the file is automatically uploaded back to the server. I can’t wait to see the new design up and running so I’m going to get started, underneath here should be the live blog section where I will post small updates to what I am doing. I will keep my eyes on the comments if you have any questions. Thank you for coming to check my progress and please remember to share this with as many people as you can. The header is coming along nicely, still not sure on this menu. Will it do for now? Woah that looks funky… A massive header! The share box looks great here http://www.validatethis.co.uk/news/join-along-with-our-live-redesign/ but Im having to rethink, try liking on FB, ideas? And were back, LIVE redesign of http://www.validatethis.co.uk Day 3 is gonna be a short one but its a labor of love so why not get a few hours in? Well work on www.validatethis.co.uk is done for the day. I will pick up where I left off after work tomorrow. What do you think upto yet? Now to add a background vignette effect. Anyone see any examples of this in the wild? 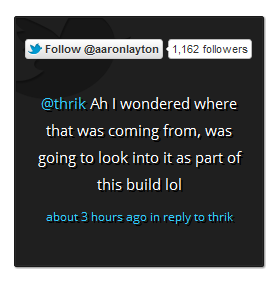 That’s both of the Twitter box’s complete, along with custom JS.. What do you think? Testing, testing, 1,2,3! Does the liveblog work? 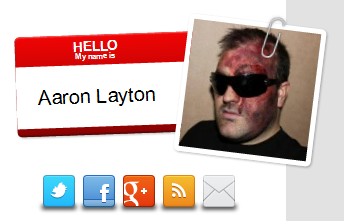 This entry was posted in News by Aaron Layton. Bookmark the permalink.